The 2018 admissions report reveals a strong increase in Sciences Po’s appeal. For the first time, the number of applications recorded exceeded 20,000, a 16% increase (20,621 total). This surge is in part linked to the reforms to the French entry procedures for the master’s level, which saw a 53% increase in applications this year. International applications also went up by 11% due to growing efforts made to promote outreach. The increase in selectivity (21% admitted in 2018 comparative to 24% in 2017) and the diversity of candidates are guarantors of the excellence of Sciences Po’s education. The incoming class size remained stable this year. Sciences Po retains its appeal for 10,957 high school students who sat the first round of entrance exams (including dual-degree programmes with Parisian universities). There were 10,112 the previous year, representing an 8% increase in one year. They come from 1,585 French high schools. This year, the exam procedure brought in 5,680 candidates, an almost 4% increase in comparison to the year before (5,480 in 2017). 3,325 candidates applied via the international procedure or for one of nine international dual-degrees, representing close to a 5% increase in a year (3,177 in 2017.) The number of candidates applying through the Equal Opportunity Programme also saw a 20% increase, with 976 high school students submitting applications (there were 813 in 2017). All procedures considered, 1,904 students were admitted, a slightly lower number than the previous year (1,914 admitted in 2017). Admitted students come from a total of 93 countries worldwide. 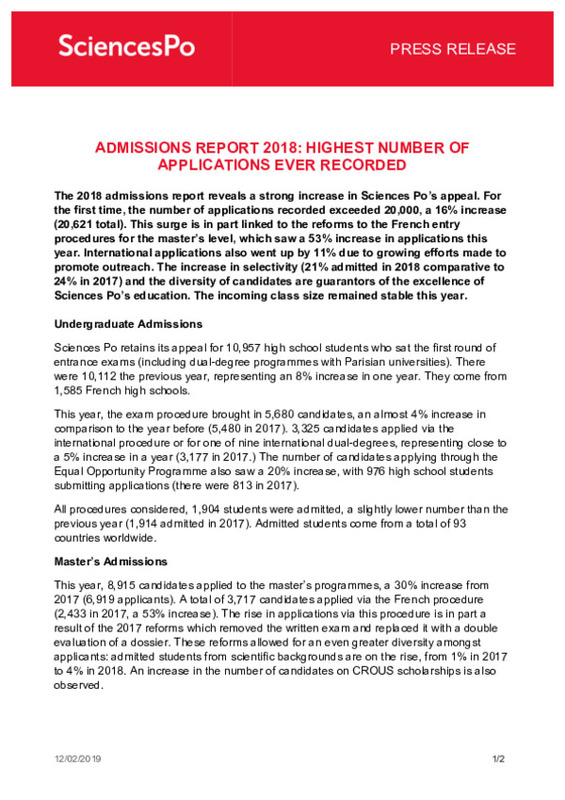 This year, 8,915 candidates applied to the master’s programmes, a 30% increase from 2017 (6,919 applicants). A total of 3,717 candidates applied via the French procedure (2,433 in 2017, a 53% increase). The rise in applications via this procedure is in part a result of the 2017 reforms which removed the written exam and replaced it with a double evaluation of a dossier. These reforms allowed for an even greater diversity amongst applicants: admitted students from scientific backgrounds are on the rise, from 1% in 2017 to 4% in 2018. An increase in the number of candidates on CROUS scholarships is also observed. 5,198 students applied through the international procedure and via the dual-degrees (4,486 in 2017, a 16% increase). 2,108 students were accepted into master’s programmes (there were 2,062 in 2017). 79% of admitted students applied via the international procedure or international dual-degrees, solidifying the success of our 38 dual-degrees with partner universities in 14 different countries. 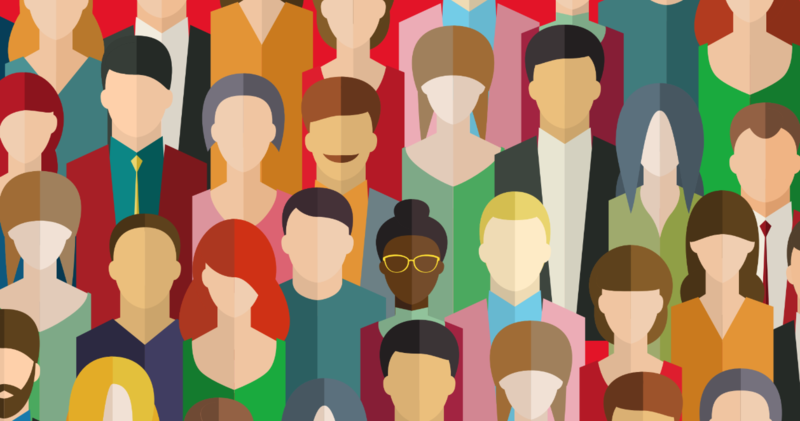 With 1,929 students admitted via the Equal Opportunity Programme (CEP) since its creation in 2001, Sciences Po positions itself as a key actor amongst higher education establishments. Besides the CEP procedure, Sciences Po’s tuition fee policy which is calculated on a degressive sliding scale along with a voluntarist social assistance policy favour a greater social mix within the institution. The direct aids offered by Sciences Po amounted to 10.5 million euros and benefited 36% of students who were scholarship holders or received financial aid (on bases of low family income, disability, or tuition fee adjustment).